A company is more than its products and services. It’s about people. People who, like you, rise and grind every day to do a job they love. People who, like you, work hard day in and day out for both a paycheck and a sense of pride. 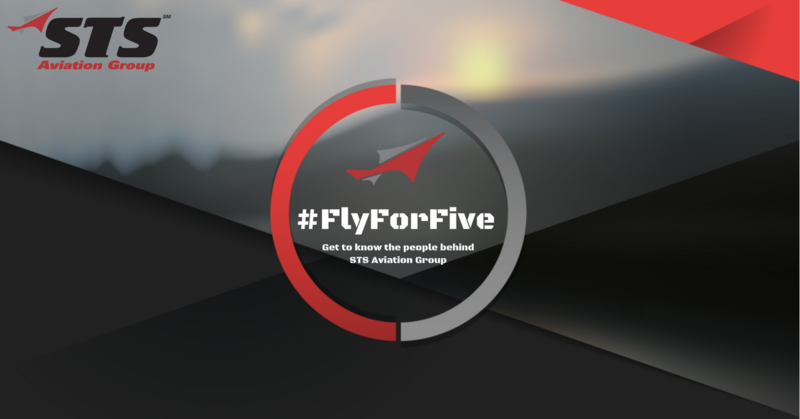 With that in mind, it is the people of STS Aviation Group and their stories that we will put on the forefront of a marketing campaign known as #FlyForFive. This article is only the fourth in this series, and because of that, perhaps a little introduction is in order. In just five brief minutes a few times each quarter, you will be introduced to a member of the STS Aviation Group family. We will ask each brave and willing participant five questions and share their unfiltered responses with you, our dear and loyal readers. The inspiration for this campaign is pretty easy to explain. First, Google loves the content, but more importantly, STS Aviation Group is nothing without its people. We think they deserve the spotlight every once and a while, and this is our way of giving it to them. OK — The time has now come for you to sit back, relax, grab a cup of coffee and settle in for a quick five. What’s to follow will not only be fun, it will also be a great way for you to get to know our leader, our friend and our Group President, Mark Smith. If you have any questions for Mark, we just wrapped his LinkedIn profile around his name, so feel free to connect with him when you’re done reading this article. Funny you should ask that question, Mr. Shaw. 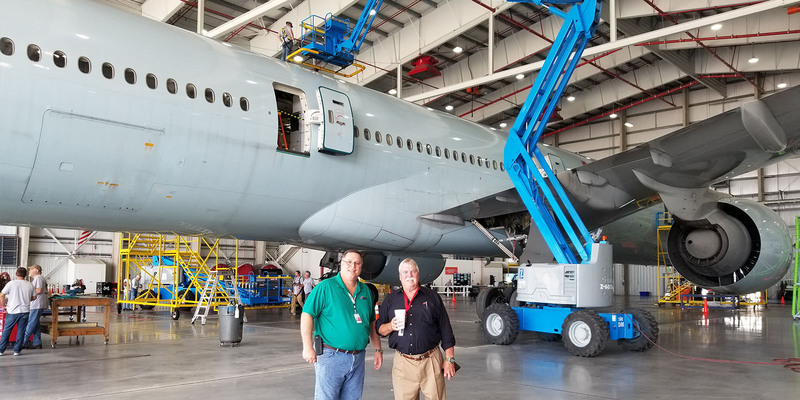 I have been with STS Aviation Group since January of 2000, and until recently, I was the acting President of STS’ staffing organization and all division of STS’ M.E.M. Group (Maintenance, Engineering and Modification). A few months before the merger between STS AeroStaff Services and STS Technical Services was announced to the public, I made the decision to transition out of staffing due to the hyper growth and expansion of the other business segments I oversee. For example, STS Line Maintenance acquired the assets of HAECO Line Services in December of 2016 and our active station count jumped from 12 to 30. Shortly thereafter, we purchased an aircraft hangar facility in Melbourne, Florida and leased another in Kansas City, Missouri. We then elected to expanded STS Engineering Solutions’ global operations, and added a new product line with the introduction of Maintenance Programs and Reliability. Then, just for good measure, we added two new companies to STS growing M.E.M. Group portfolio, STS GSE Services and STS AeroMod. So, as we move forward, I will continue to serve as President for all of the companies that fall under STS’ M.E.M. Group. How did you end up in your position? Did you always want to work in the aviation industry? To be honest, I had dreams of playing baseball. I may have done it, too, but life happened. I injured my knee, met my wife, and had kids. You know the story. My dad worked for American Airlines for 40 years, so I always had a love for aviation but didn’t get my start in the industry until a former major league baseball player named Ken Suarez invited me to work inside an engine overhaul shop in Texas. In the mid 90’s, I met Phil Anson while he was at Eastern Airlines, and when he became President of STS Services, he convinced me to come join him. The rest, as they say, is history. What makes STS Aviation Group such a unique organization to work for, in your opinion? For me, it’s all about the people… our employees and our clients. Our employees are hard working and take ownership in what they do, and they have helped make us what we are today. What keeps you motivated and working hard day in and day out? I really enjoy the daily challenge of overseeing and managing the operations for our Maintenance, Engineering and Modification group. Each of the divisions that I oversee offers our customers something different. Creating synergies, however, across each of those divisions is what I love the most about my job. Finding new ways to serve our customers, new ways to solve client pains… all of this stuff gets me excited. I’m passionate about the work, and my team is, too. That keeps me motivated. What is one surprising thing that most people don’t know about you? Believe it or not, I’m a pretty good cook. I love to Barbecue and smoke meats. I’ve even won awards at BBQ cook off’s. I also love to golf, and I use to be pretty good but don’t play enough to stay as good as I once was.